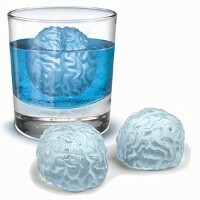 Now here’s a literal interpretation of brain freeze whenever you are thirsting for an ice cold drink – thanks to the Brain Freeze Ice Tray which will come up with ice cubes that are in the shape of – yup, you’ve guessed it right, a human brain! This humorous addition to your kitchen would definitely be enough to get conversations going, and is a surefire winner for an icebreaker during parties with plenty of strangers around. Whip out an ice cold cuppa today with the £6.99 Brain Freeze Ice Tray.